This important and incisive new book examines contractual enforcement mechanisms in Central and South-eastern Europe and the Commonwealth of Independent States. The volume is an outcome of the cooperation between the European Bank for Reconstruction and Development and the British Institute for International and Comparative Law. The EBRD and BIICL have facilitated both formal and informal dialogue and cooperation on contract enforcement issues. The rich and informed debate between practitioners and academics, together with the representatives of international organisations, policymakers and judges is reflected in this book. What has been the role of the rule of law in development and protection of contractual rights in transition nations of Central and South-eastern Europe and Commonwealth of Independent States? What is the role of courts in these countries, their structure, independence and integrity? Practical aspects of contract and obligations enforcement; what framework should they follow? When it comes to arbitration or alternative dispute resolution, who are the main actors and what is the appropriate script? The book highlights that after more than thirteen years of transition, contract enforcement has not reached a stage where it provides the required basis for economic development. It requires sustained attention from national governments, regional bodies and the international community. The book concludes by examining the appropriate way forward. 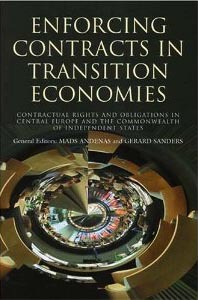 "Enforcing Contracts in Transition Economies"